Seriously, I cannot tell you how much this one idea has simplified my life. The past two weeks, our school has been hit by a nasty cold bug AND strep throat. I’ve have so many absent students! But, with my hanging wall organizer for absent work I have been taken COMPLETELY out of the mix. My dear friend Megan took me to the Container Store in St. Louis during TMC and showed me these fabric wall mount magazine holders. I bought one for each subject I teach (6th and 7th grade), then I labeled each pocket for one day of the week. The remaining bottom two pockets are make-up quizzes and returned papers for absent students. So, when a student isn’t in class, I label their paper with their name on it and then put it in the appropriate day. When they come back, THEY DON’T HAVE TO ASK ME FOR THE MAKE-UP WORK! Update: The letters are from Target. They are a pack of giant post-it letters for about $3. To label the pockets, I used the Martha Stewart fabric labels that I got at Staples. I am soooooo going to do this! I have one similar hanging file already, but I’m not making good use of it. I’m going to get one more and my life will be so much cleaner. I’ve been recycling my extra copies because all of you bloggers gave me permission to do it and I am ecstatic over how much of my desk and tables I can see. If I can get my absent papers all organized I will be able to see my calendar desk blotter. I do this in a simplified way. I have a color-coded folder stapled to the bulletin board for each period. I put a missing student’s things in the right folder with a paper clip and just add to the paperclip if he or she is out multiple days. While I haven’t had tons of absences, several kids have taken advantage of getting their things without asking so they don’t have to interrupt class. It’s nice. But those hanging things are sure pretty. Maybe the next time I’m at a real store! When a student is absent from my class, they will find their work under a magnet on the white board. I also staple the notes that they missed so they can add those to their notebooks. 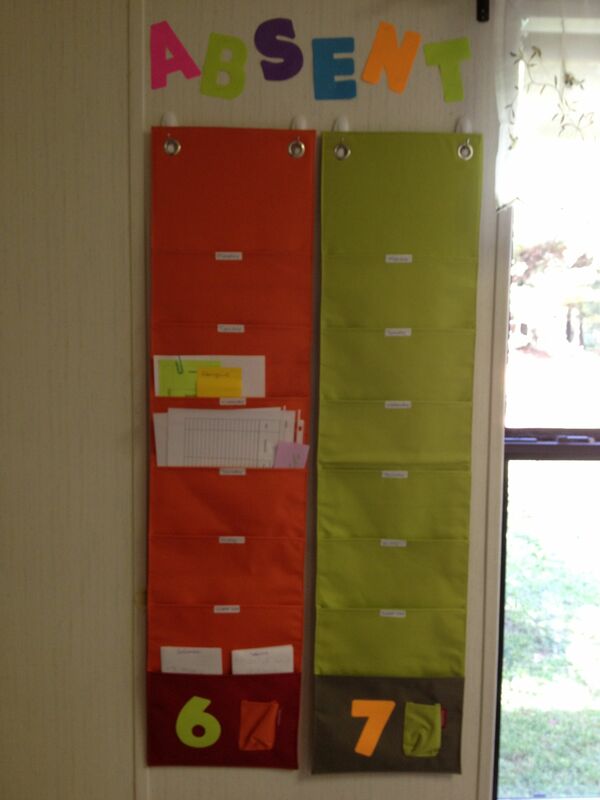 I has worked pretty well, but I really do like the hanging folder idea! I’m a guy and I might even do this. What a great tool for organizing stuff. I’ve put names on stuff if they’re gone, but then they’re just in a pile on my table. I miss TMC 😦 I love this idea! I do something similar, but I kind of like your method better! Awesome!! I made a hanging file folder with some scrap fabric that I had lying around (see? http://makingpaperairplanes.wordpress.com/2012/08/20/folder-storage/). I originally intended to use it for something else, but I am totally going to change it over to use it in this way! Days of the week is an awesome adaptation! Put mini post-it notes and a marker in the little pocket at bottom and voila! your materials are at hand all the time. Yes, @kaleb40, even guys can do this (heck, I’m fashion and organization-challenged and it was MY idea to start!). Don’t believe her! She has the coolest fashion sense of us all! Especially in the shoe department! Do you have another place where you keep extra copies of assignments/notes? corazón caminará siempre fuera de tu cuerpo – E.